Morecambe's Alex Kenyon shoots on the turn against Portsmouth earlier in the season. Jim Bentley believes Morecambe siting above Portsmouth in League 2 is an “outstanding” achievement. 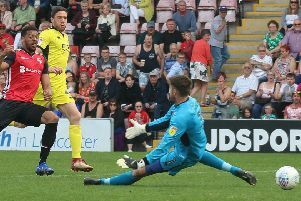 The Shrimps, 12th in the Football League’s bottom tier, are a point and two places above Pompey ahead of Andy Awford bringing his side to the Globe Arena on Saturday. On paper, it looks like and end-of-season clash with little on the line but Bentley insists there is plenty to play for. He said: “We’re at the other end of the scale to Portsmouth with regards to fans, facilities, backroom staff and the like. “They shouldn’t be at this level but they are. “They’ve dropped down and look like they’re going to get themselves sorted out and get themselves properly back on track to maybe have a run at it next year. “But they were one of the favourites this year so for a team like Morecambe to be ahead of them in the division is outstanding. It is a game that pits a side with a poor home record, Morecambe, against a side who struggle to win on their travels. The Shrimps are without a win in five at home, picking up just one point in the process, while Portsmouth have won just two league games on their travels all season. But Bentley is wary of a side who have players such as the league’s top scorer Matt Tubbs in their ranks. He said: “Portsmouth are a massive club and they’re always going to have good players. “Matt Tubbs has gone in there, (Ryan) Taylor up top is scoring a few goals for them and I think (Jed) Wallace is probably the second best player in the league behind Bury’s Danny Mayor. “He’s in good form and scoring goals so we know it’ll be a tough game. “Their away record’s not great but our home record’s not great. “It’s got the makings of a competitive match and a good atmosphere because their fans will travel in good numbers. A win for Bentley’s men, on 54 points, would see them take a big step closer to his next target of 60. He said: “Our next target has got to be top-half, a plus goal difference and to get to 60 points. “That’s the targets we’ve set them.